Learning about the risks associated with a CDH1 gene mutation can be frightening and overwhelming. However, we believe that being proactive and making informed decisions about your health care is empowering as well as life-saving. Here we will provide you with information, guidance and resources to help you through the genetic counseling and testing process. 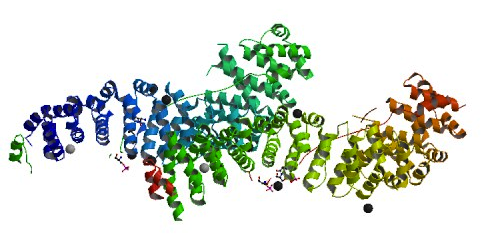 E-cadherin is a protein – encoded by the CDH1 gene. 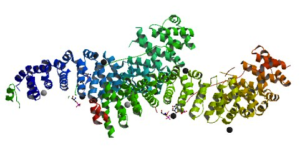 This is an image of the structure of the E-cadherin protein chain which bends and turns. The normal function of the E-cadherin protein is to allow cells and tissues to adhere to one another in a normal fashion. One of the genes in our body is called CDH1. It is located on chromosome 16, and when it is functioning properly it provides instructions for our cells to make the e-cadherin protein, and allows cells to adhere to one another in an orderly manner. Hereditary Diffuse Gastric Cancer (HDGC) syndrome is sometimes caused by an inherited mutation (or error) in the CDH1 gene. This mutation interferes with the normal function of the e-cadherin protein and can result in cancer. Everyone has two copies of the CDH1 gene — one copy inherited from their mother and one copy inherited from their father. If one of these CDH1 genes has a pathogenic mutation, this means the person has Hereditary Diffuse Gastric Cancer (HDGC) syndrome. If someone has HDGC, each of their offspring has a 50% chance of inheriting the mutated CDH1 gene, and an equal 50% chance of NOT inheriting the mutated CDH1 gene. It is a 50/50 chance per individual, not per all family members. The process is completely random.